Wera Kraftform 6 Piece 160 i/6 VDE Screwdriver Set is designed for the professional user. Wera's multi-component ergonomic handle fits the shape of the hand for the ultimate in comfort and high speed torque. Lasertip micro-rough drive ''bites'' into the fastener to insure a perfect fit and reduce cam-out effect. 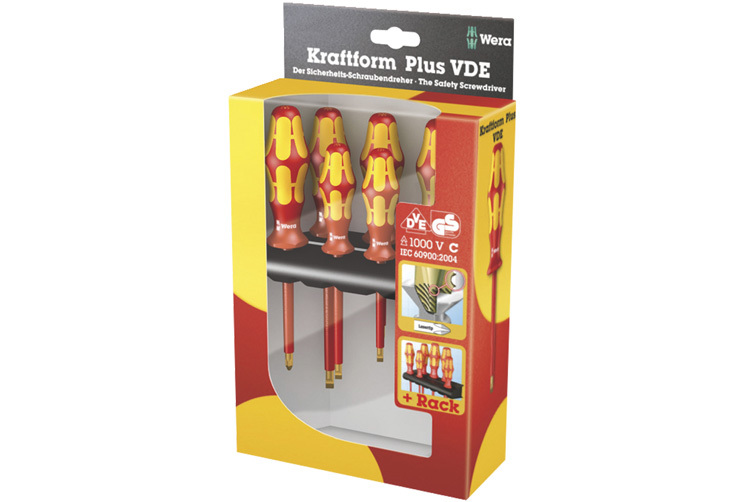 The 05006145001 Wera Kraftform 160 i/6 VDE 6 PC Screwdriver Set With Rack is one of thousands of quality tooling products available from MRO Tools. Please browse Wera Tools Top Sellers for tools similar to the 05006145001 Wera Kraftform 160 i/6 VDE 6 PC Screwdriver Set With Rack. 05006145001 Wera Kraftform 160 i/6 VDE 6 PC Screwdriver Set With Rack description summary: Wera Kraftform 6 Piece 160 i/6 VDE Screwdriver Set is designed for the professional user. Wera's multi-component ergonomic handle fits the shape of the hand for the ultimate in comfort and high speed torque. Quantity discounts may be available for the 05006145001 Wera Kraftform 160 i/6 VDE 6 PC Screwdriver Set With Rack. Please contact MRO Tools for details.